Water Garden are pleased to announce the launch of the all-new BioTec ScreenMatic ECO Filter Sets, which include the new OASE Bitron ECO Ultraviolet Clarifiers. Two brand new filter systems have been launched for larger ponds and lakes; The BioTec ScreenMatic ECO 120000 Set and the BioTec ScreenMatic 140000 Set, catering for ponds up to 120,000 Litres and 140,000 Litres respectively. The ECO 120000 Set includes the BioTec ScreenMatic 36 Filter, with it's automated Screen Drive mechanism which pre-filters larger pond debris on a rotating screen, allowing the main filter foams to tackle smaller particles both mechanically and biologically. The new Bitron ECO 120 Watt Ultraviolet Clarifier mounts directly to the BioTec filter box and offers class-leading algae kill rates and flocculation. 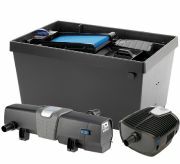 The Set also includes the energy efficient Aquamax ECO Premium 20000 Filter Pump which can be directly submersed into the pond or dry mounted, supplying polluted water to the Bitron ECO UVC and BioTec 36 Filter. The ECO 140000 Set features the same Biotec 36 Filter but features the more potent Bitron ECO 180 Watt UVC and the Aquamax ECO Twin 30000 pump to cater for larger pond volumes up to 140,000 Litres (31,100 Gallons) and Koi Carp stocked ponds of up to 35,000 Litres (around 7,800 Gallons). The largest Filter Set can be upgraded on request to feature the most powerful Bitron ECO 240 Watt UVC which is particularly useful in shallow ponds which are subject to full sunlight. The BioTec ScreenMatic ECO Sets can also be supplied for much larger pond or lake water volumes simply by running multiple systems in series, offering multiple points of suction, circulation and suspended algae removal. Contact Water Garden for advice or expert technical assistance with any of our OASE Filtration Systems. View all of our Biotec ScreenMatic Filter Sets here.